This is a spacious (1300 square feet) ground level, three bedroom, two bathroom, ocean view condominium, in the very popular, upscale Makahuena Resort located in the center of Poipu. It's size and internal layout provides spacious comfort for as many as 8 but works perfectly well and is priced for smaller groups. You might want to invite your family or friends to share the cost as they will be comfortable too. Check our monthly rates as we encourage longer stays. View our guest comments to see why our condo is so popular. The resort complex sits on a cliff overlooking the ocean providing an unforgettable view and experience. You can view both sunrise and sunset from the site 'Point' a few steps from our lanai where the sound of the ocean and it's spray is breathtaking. The Makahuena is in the center of the Poipu golf world including being walking distance from Poipu Bay, former site of the Grand Slam of golf. The Makahuena contains it's own tennis facility (a rare commodity in Poipu condo complexes) bringing that sport steps from our unit. Top rated sandy beaches that provide sunbathing and surfing are less than a ten minute walk to the east (Shipwreck Beach) and to the west (Brennecke's Beach). Brennecke's beach has a breakwater that provides protected beaches for toddlers and calm waters for snorkelers. If you are traveling with children or people that enjoy the pool or spa, ground floor units such as ours have a huge benefit in the ease of access to these popular items. You are step free seconds away from the pool gate to enjoy or check your kids swimming. The Makahuena is made up largely of three story buildings with no elevators, and pool access from upper units requires many steps to the opposite side of the pool then walking around the buildings. A somewhat time consuming and strenuous task. The floor plan is all contained on one level eliminating the need to climb stairs to bedrooms or second bathrooms. Our seniors especially appreciate this convenience but everyone loves it. Additionally, the ground level location allows step free access to the impeccably maintained grounds, pool, spa, barbecue, view point, and other entertainment areas. The kitchen was completed renovated in November 2014; new granite countertops, Solid Mahogany door and drawer fronts provide a stunning look. Elegant Tile Flooring was installed in all three bedrooms adding a very upscale look and providing a cooler (temperature) unit. The master suite is a large bedroom containing a new Simmons Beautyrest California king bed. It has it's own bathroom which contains two large counters (his and hers) instead of the usual one. This bedroom opens directly to the lanai providing it's own ocean view and instant access to the beautiful grounds and all it's features. The second large bedroom also has a California king bed and both of these bedrooms have their own televisions. The third bedroom is smaller, but large enough to contain two brand new plush full-size beds. If this bedroom is not needed it makes an excellent location to store luggage and golf clubs. Master Suite with King Bed. Full bathroom in adjacent room. High Definition TV and Blu Ray. Two Full-size beds (not twins) adjacent to full size bathroom. Fold out mattresses in closet for overflow for kids. The unit has been recently redecorated including some new furniture and beautiful tile and paint. The unit has a High Speed Internet Connection with a wireless router making web contact especially convenient. Poipu Beach is Kauai's most desirable area and was just rated the #1 beach in all of America. 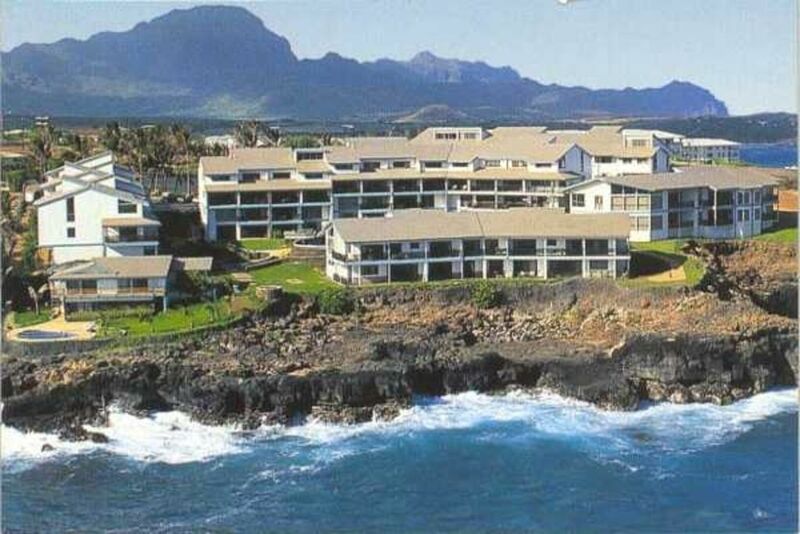 You will love your stay at the Makahuena and in particular in this condominium. The unit is easily large enough for two couples to share with adequate privacy. There are three televisions and two DVDs to keep the kids entertained in a separate room remote from adult conversation. My wife and I purchased our condo a few years after Hurricane Iniki and have taken great pride in restoring this treasure to a level that allows ourselves and all who use it, to enjoy there stay in Kauai to the fullest. Everything has been replaced or restored. The beds and furniture are new and extremely confortable and the floors have been tiled or recarpeted. The walls were repainted in June 2010 and a large mirror installed over the couch at the same time appears to bring the ocean into that room. It's amazing! We would love to have you stay in our place. Our referrals speak volumes. Jim and Lea Heckman Tucson, Arizona and Port Angeles, Washington. We have traveled all over the Hawaiian islands and nothing compares with Poipu beach. Although Poipu is remote and quiet compared to the much more populated Mauai and Oahu, it still has every thing needed for a memorable vacation in Hawaii. Poipu was the right choice for all our activities, located half-way between Lihue (airport and Wailua River) and the western ports (diving and Catamaran tours). A nice walk along the trail past Brenneke's Beach to the Sheraton (luau and surfing), or along the road (shops), was a definite option. Two couples sharing the cost made this unit easily affordable, and our views of the ocean were better than we had expected. The condo was very comfortable and well equipped. Thanks for the opportunity - We hope to be back!! So glad you enjoyed our home Brad and thanks for sharing the convenience of our location. It truly is central to almost everything, and a short walk to so many features, including the best beach on the island. The accommodations were perfect. We loved the location. It was a quick walk to Poipu and Shipwreck Beaches. We saw turtles, monk seals, and whales. We hope to return at some point! Thank you, Jim! Clean, but older condo close to the pool & with sunset views. Excellent value! This was our fifth visit to Jim's property, obviously we love the Poipu area and staying at Jim's condo makes it that much better. We were a family of six including two young grandchildren who were in the pool every day, the pool being right next to the lanai. The kid safe area at Brenecke beach was also a hit as was the hula dancing and Papalani's ice cream at Poipu shopping centre. I would recommend a visit to the area and Jim' place in an ideal spot to stay, the views from the lanai are unbelievable, the sunrise,sunset and whale watching. Evelyn, Jim's representative in Poipu looked after our needs in a timely and efficient manner. Thanks for the kind comments Alwyn. We are pleased that after 5, month long stays each winter, you are one of our favorite Canadian guests. We are happy for you that you are able to escape the intense winters at home to land in sunny Poipu and stay in our wonderful home, for an extended period. Thanks for pointing out the things you and your family love to do so ably, because of our unique location. The property was well kept and in a perfect location for access to the surrounding beaches. It took 30 seconds to walk out the back door to the cliff overlook on the ocean, a great place for morning coffee.The condo was very nice, clean and spacious. The Kitchen was awesome and very well stocked with nice cookware and even tupperware. All appliances worked well. FYI there are boogie boards and beach stuff in the closet, didn't realize that until late into our stay. Only real complaint is wish the pool/hot tub had better hours, not opening until 10am is way to late and closing at 8pm is too early. Never made it in. Overall I would definitely come back here again! The condo was great. It was spacious and clean and allowed our party of five to be comfortable. There was a washer and dryer, which we used and a full kitchen with all of the amenities. There were ceiling fans and regular fans, which we needed as the tradewinds were not blowing for a portion of the time. There was easy access to the pool and tennis courts. Note that this unit is down two flights of stairs which did pose a small challenge to my elderly mother. But overall, it was a good unit and we enjoyed our stay. * Some holiday periods extra. Rates do not include Tax and Cleaning, extra charge for large groups.